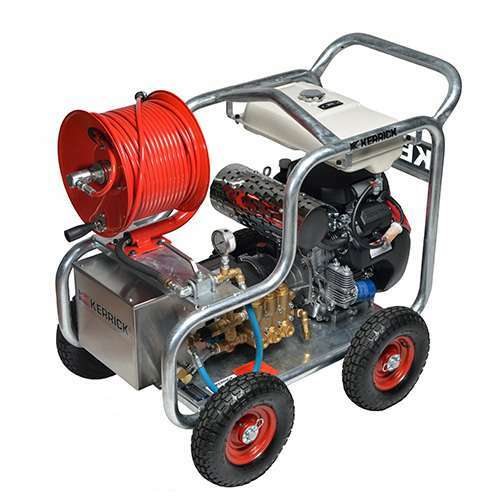 The unit has a GX Honda motor with electric engine start coupled with a Hawk Italian low speed pump on a heavy duty hot dipped galvanized frame, as well as 4 12″ pneumatic wheels giving fantastic manoeuvrability over rough terrain. The Jetter range is manufactured in Australia to meet the high standards of professional plumbers, contractors and end users in the sewer/drain cleaning industries. Kerrick Jetters include a break tank to help protect the pump during stop/start and remote operation during jetting. These units are manufactured using high quality components that can withstand the harsh environments and heavy usage associated with these industries.